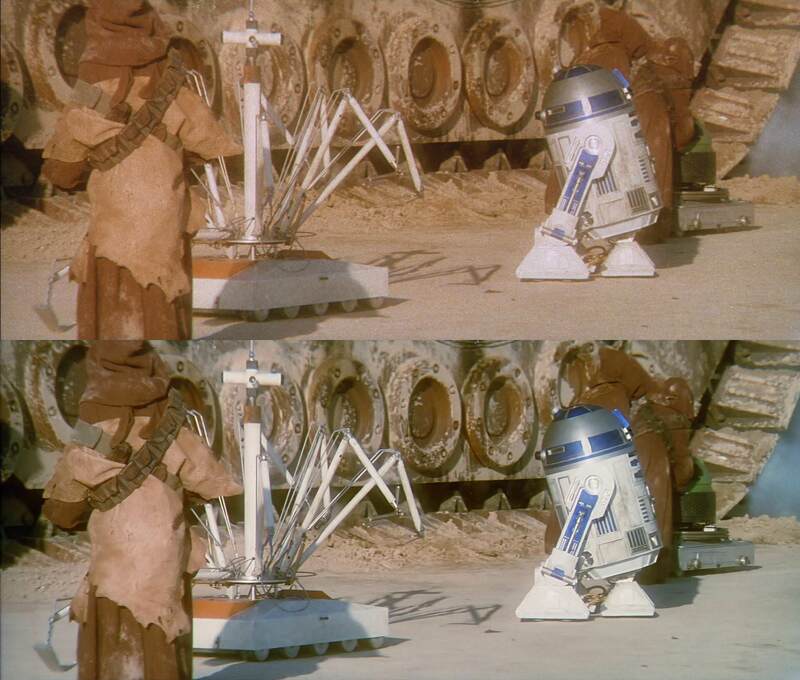 Both the 1080p and 2160p (4K UHD) DNR versions are now posted in a.b.starwars newsgroup on Usenet. There is a ‘4K77 artwork’ thread in the ‘Case Covers, Disc Labels and Fan Art’ section of the site which may have a few choices mate, and there’s also a few 4K77 blu ray covers and misc 4K77 art in there too. there are several other versions of 4k77 in the works if this one did not please you. i don’t think rob is going to work on it any further, but some other people will. Is there any chance we could get a proper DNR version in the future? This is the proper DNR version. There will not be another offical one from TN1. But there are multiple offshoot projects in the works that use 4K77’s lossless source files as a base, as Collipso said, so you’re probably gonna want to wait for one of those to come out. If you used avisynth for DNR I’d love to know the settings. When I’ve tried it in avisynth in the past, DNR just makes fast moving scenes look smudged so to speak. 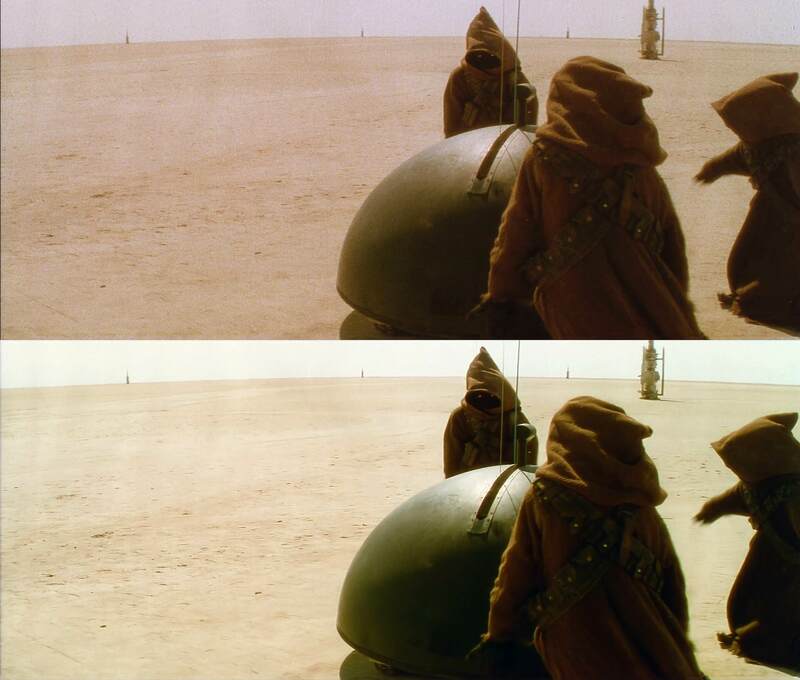 Honestly its going to get very messy from this point on, over at the 4K77 forums there are half a dozen people doing their own color grade, several versions all at varying stages of restoration. I think projects should either stick to original unaltered colors or go all out and do a proper shot by shot grade for consistency and balance and to make it what a real back to negative restoration would be. I like the latest release, but It could be a lot better. Since my external HDD is starting to fill up, should I replace Harmy’s 2.7 with the 1080p DNR for the moment? They are two totally different approaches to restoration, watch both and see which one you prefer watching. There is no definitive answers as to which one is “Better”. You’re absolutely right about the color inconsistency, and I knew that before it was released - it really needs a final color correction pass to make sure each scene is consistent shot to shot, but I just didn’t have it in me to make that additional pass. I’m really hoping that one of the spin off projects can finish it off properly. But this is also exactly why I made the noDNR version the way I did. Initially that was going to be color corrected too, and in fact the whole project was delayed more than 6 months while at least 5 people took a crack at the color correction, but I still wasn’t happy with any of them, so I had to go through and undo all the color changes, in favor of the simple, per reel white balance that would allow everybody to make their own color choices and make the film look however they wanted it to look. I’ll walk you through the process I used for the DNR version, and then you’ll have a better understanding of how we got to where we are, and what you will want to do differently if you take a crack at it yourself. All that noise and grain provided an illusion of sharpness, so some sharpening is required at this point - I used RevisionFX SK Sharpen, and increased the contrast to make everything look sharper. Finally, I used a commercially available, 4K Kodak 5219 35mm film grain layer to add a consistent level of grain throughout the film. For RC2 I went back and did a shot by shot curves adjustment, adding back some of the red and yellow that PFClean had removed, and made an effort to ensure that everytime we cut to Luke, for example, the colors matched the last time we cut to him at the same camera angle. It was at about this point I noticed that when we cut back to Ben, the colors were not quite the same as when we cut to Luke - the sand/rocks/walls were different enough that I knew it needed fixing. But, it was May when I started working on the DNR version and now it is September. At some point you just have to call it and let it go. Let somebody else have a crack at it. I’ve been cleaning Star Wars every day since 2013, first with the Silver Screen Edition and then with 4K77. There’s always more that I could do to make it better - always! But after 5 years I just want to move on to something else - or I’ll risk becoming like Lucas himself - unable to stop tweaking the film even after 30 years! I have the scan of The Living Daylights print to work on, scans of the 16mm Making of Star Wars, From SW to Jedi and Classic Creatures, some 16mm and 35mm trailers for other films and TV Spots, and a little film called Return of the Jedi to finish up. I’m sure Poita can do a better job than me, and hopefully one day we’ll get to see his own restoration of the film. 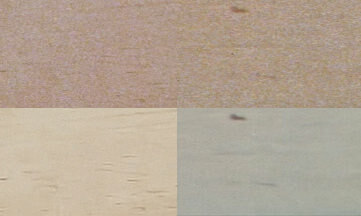 There is also his scan of the SE print to consider - a lot of that scan could be used to upgrade the 4K77 footage. 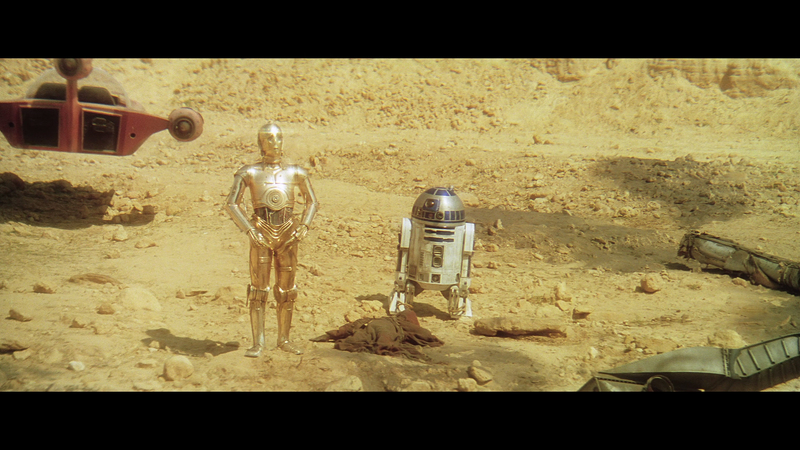 But until then, I’m afraid it’s just not going to get much better than this - unless Lucasfilm rescans the original elements in 4K (or 8K) and reassembles the original cut of the film for us. should I replace Harmy’s 2.7 with the 1080p DNR for the moment? Well, my work is done here. Can someone PM me some captures of Leia’s hologram in Luke’s Garage from 4K77 really quick for my Visual Comparison research? Thanks. Watched this projected yesterday and this is amazing 😃, well done Williarob and everyone else involved. Thanks for all the hard work over the years. Which does Harmy prefer? No-DNR or DNR? No worries mate. I do wish you were feeling up to having a go at it yourself, I’ve always admired your work on the Team Blu projects. If things change, let me know, and I’ll gladly share the cleaned but not yet color corrected/sharpened (or DNR’d) prores files with you. As usual with this sort of project, it’s hard to pin down when this might be finished, but keep any eye out for it sometime in the future. I’m told colors aren’t finalized yet, but they are in the ballpark. The creator, “SkyDude”, is using 2500+ 35mm Technicolor frames for quick color reference, but also has access to a complete, original Technicolor print, and it’s his job to restore films, so I’m hopeful that his project - and others like it - will continue to build on the foundations TN1 has provided, and push the quality envelope even further than we ever thought possible in our little community. Perhaps the project has been renamed to acknowledge Dreamaster’s contributions to the color correction? In any case, it’s the same guy.